When it comes to kids Easter crafts, there are tons of bunny, egg, and chick crafts. But there is a lot more to Easter. This preschooler cross craft is perfect for introducing the true meaning of Easter. This simple preschooler Easter craft turns out so pretty. You may also like this activity to explain how Jesus removes sins. Have your child to glue the tissue paper squares onto their white craft paper. They may choose to glue them in a pattern, or just randomly glue the squares. Once they are finished gluing the tissue paper, cut a cross shape from the brown construction paper. Glue it atop the colored squares. 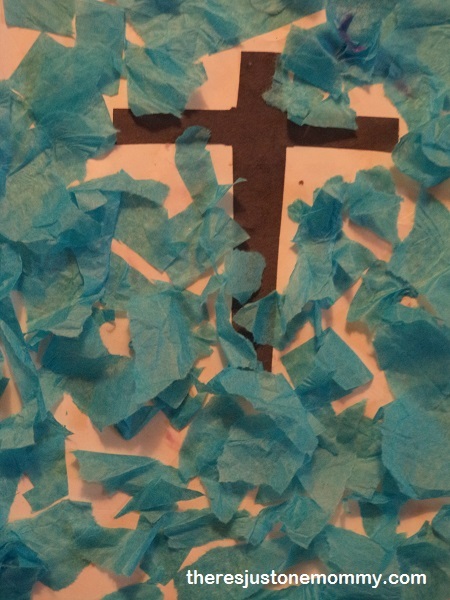 As an alternative, your child can glue the cross on first and then add the tissue paper. This is what my preschooler did, applying his glue stick very liberally, all over his paper, so he could sprinkle his tissue paper pieces onto the glue so he wouldn’t need to touch the sticky tissue paper pieces. 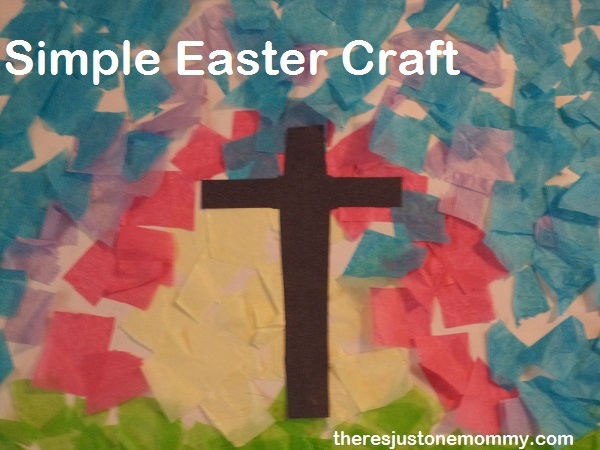 This simple preschooler cross craft for Easter is a wonderful way to start a discussion about the reason behind Easter. That is just lovely! 🙂 I love Easter time.